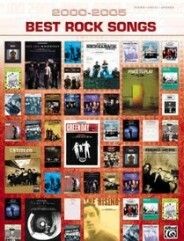 Alfred is pleased to release 2000-2005 Best Rock Songs, the latest addition to Alfred’s Best Songs series of books. Distinguished by genre, each book in Alfred’s Best Song series provides the lyrics along with piano and chord arrangements for some of the most popular hit songs released during the first five years of the new millennium. Songs are listed alphabetically, making it easy to find the songs you’re looking for. 2000-2005 Best Rock Songs includes over 30 Billboard-charting hits from rock artists like Green Day, Nickelback, Bruce Springsteen, Bon Jovi, Simple Plan, Staind, Chevelle, and Sugar Ray. When It’s Over (Sugar Ray), and many more!